Over the past 40 years, ACH has grown to become one of the largest, safest, and most efficient systems in the world of banking. The network now handles $43 trillion worth of transactions every year. ACH transactions are a cost-effective and quick way of settling payments, making them a preferred go-to option for many businesses. 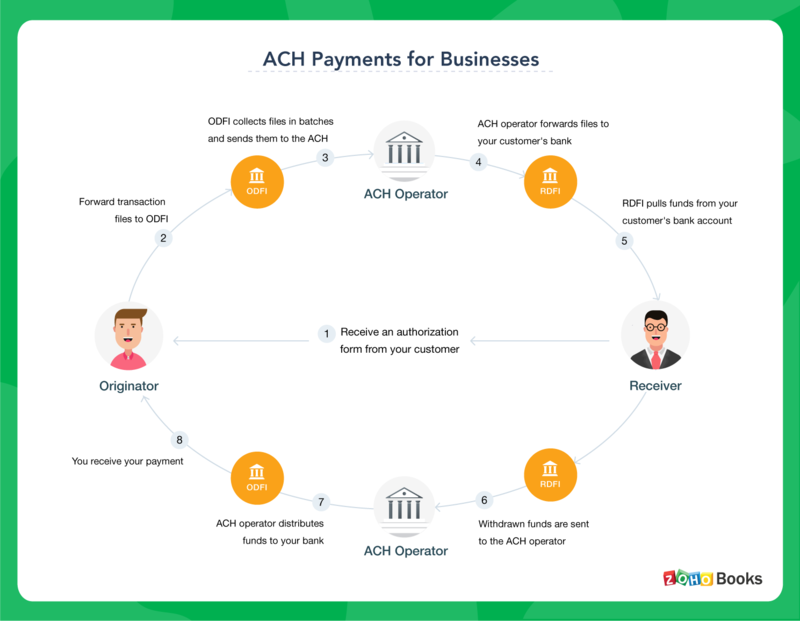 As a business owner, you’ve probably heard of ACH payments, but might not be familiar with how they work. This article will guide you through the basics of ACH and how it compares with other payment modes. ACH payments are a form of electronic bank transaction made using a network called an Automated Clearing House (ACH). Technically, the ACH network is a system of computers that communicate with each other to make and receive payments. Every transaction consists of two computers: one at the sending end to send a request for payment, and another at the receiving end to accept the request. Businesses in the US use ACH payments for paying bills, wages, mortgages, and loans, and for making direct deposits. Electronic payments made through the ACH network must follow guidelines provided by the National Automated Clearing House Association, or NACHA. What are the different types of ACH transactions? There are two types of ACH transactions: direct deposit and direct payment. Direct deposits are initiated by the payer to send funds directly to a receiving account — for instance, to pay wages to an employee. Direct payments are initiated by the recipient to request funds — for instance, to automatically collect payment for recurring bills. How do ACH payments work? An ACH transaction basically consists of a data file containing information about the desired payment. Processing a transaction consists of sending that file to the originator’s bank, then to the clearing house, and finally to the recipient’s bank, where the funds are transferred to the receiving account. Let’s look at how to initiate an ACH direct payment — for instance, to bill a customer. Before starting the transaction, make sure you are allowed to pull money from your customer’s bank account. Your customer can give you permission by filling out an authorization form with their bank. As the Originator, you start by sending data files about the transaction to your bank, which is called the ODFI (Originating Depository Financial Institution). These files include the transaction type (debit or credit), routing numbers, and bank account details. Your ODFI collects all transaction files sent to them and forwards them at regular intervals to an ACH operator, either FedACH (Federal Reserve Banks’ Automated Clearing House) or the Electronic Payments Network (EPN). The ACH operator then sends the data files to your customer’s bank, which is called the RDFI (Receiving Depository Financial Institution). How do ACH payments compare to other payment methods? Generally speaking, ACH payments are more efficient than card, wire transfer, check, or cash payments. Because ACH transactions pass through a single clearing house without a lot of intermediate steps, they offer lower transaction costs, better security, and more convenience than other payment methods. ACH payments are known for their low transaction cost compared to credit card and wire payments. Whereas credit card transactions cost around 2% of the payment amount, and wire transactions cost $10-35 each, ACH payments cost under $1, regardless of the amount paid. Although wire transfers are quick, they are irreversible. During a wire transfer, there is no way of verifying the sender or recipient’s identity. Since these payments cannot be reversed, it’s easy to pull off a wire transfer scam using fake identities. With ACH, payments are reversible and users are authenticated to prevent fraud. Every financial transaction comes with a concern about how secure it is. This is because payment errors such as bounced checks, misused credit card information, wire transfers sent to the wrong recipients, and cash theft can do serious damage to your business. ACH provides secure payments by allowing direct transactions between two parties with no mediator in the middle. Unlike with other electronic payment methods, you can set up a recurring payment without asking your customer to provide their bank account information every time. By sending private information less frequently, ACH reduces the chances of fraud of erroneous payments. Recurring ACH payments allow you to spend less time on each transaction. Once you and your customer set up a recurring payment, every transaction made after that is automated. Your customer doesn’t need to worry about missing a payment, because they are taken care of automatically. Likewise, you don’t need to chase late payments or remind customers to pay. A common reason behind customer churn is payment failure. Payments made with ACH have lower failure rates than those made with credit cards, because credit cards have the possibility of expiring. Since ACH payments are made directly from bank account to bank account, they reduce the chances of payment failure and therefore customer churn. The ACH network is a secure and economical way for your business to send and receive funds, especially if you handle recurring payments. Its simplicity and ability to reduce customer churn make it an appealing alternative to conventional payment methods like cash, check, card, and wire transfer. If you want your business to have the best possible footing, then switching to ACH payments is a good move.